Prefurbia is a method of designing sustainable neighborhoods. Previous parts of this series (June, Sept., and Nov. 2010) compare the process of Prefurbia with an existing site plan to create a design benchmark, introduce multiple Prefurbia concepts, and demonstrate architectural shaping as a component of covings. This final installment addresses the question of how the numbers (economics) compare. Planning by numbers is kind of like painting by numbers; it does not give you the best picture. There are many intangibles in site design that cannot be placed on a financial table but are just as important as any numerical value. Let’s look at the numbers. A few things become apparent. Prefurbia reduced overall paving by 7 acres or 37%. 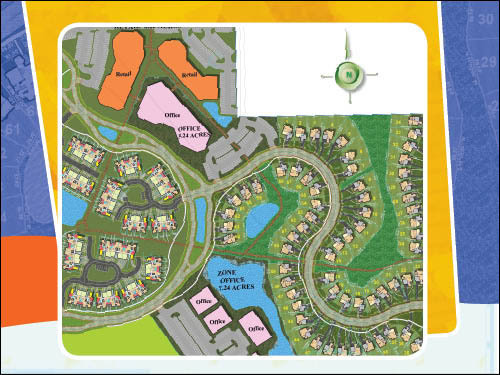 The walks on the before-plan are 5 feet wide while Prefurbia has walks 6 feet wide and main trails 8 feet wide. The walks serving Prefurbia are more inviting, useful, safe, and direct—yet with a reduction in surface area of one acre! The paved areas serving office and apartments in the original plan have 460 parking spaces (not including townhomes, which have 2 spaces per unit); the Prefurbia layout has 520 parking spaces. The combined private paving serving townhomes and non-residential is not exactly apples to apples because the original plan had apartments; however, 1.3 acres less overall paving in the Prefurbia neighborhood and an increase of 60 parking stalls comprise an impressive gain. But what about density? The original plan apartment area was converted to office/retail use, so the comparison will be townhomes and single family. The density appears to be the same, but remember that the single-family area on the original plan had the single-family lot lines extend to a private street 24 feet wide, not the required 50-foot-wide right-of-way. To be conservative, the actual density might drop to comply. The Prefurbia plan complies with existing regulations. Based on assumptions, income potential increases by $180,000 with the Prefurbia neighborhood. From a public street comparison, the original plan had 5,490 linear feet of it, while the Prefurbia plan has 4,006 linear feet. Both plans have sections of streets that are divided, increasing costs over a standard street section but adding neighborhood character. For estimating purposes only, using $300 a linear foot of street, the Prefurbia Neighborhood should reduce public street infrastructure costs by $445,000. Running some quick simple numbers, we see the Prefurbia plan has an advantage, once again, based on assumptions, of about $625,000! Let’s compare the homes—the original plan to Prefurbia. The original plan had 76 townhome units with geometry that would comply with regulations. The total area of townhomes is 99,429 sq.ft., or 1308 sq.ft. per unit ground coverage including the garage. The 64 townhomes in the Prefurbia neighborhood cover 89,137 sq.ft., equating to 1,392 sq.ft. average per unit, a gain of 84 sq.ft. of living area on the main floor. If the townhomes sell at $120 per square foot (assumption) then the value of the townhomes in the Prefurbia plan would be $10,000 greater per unit. But the townhomes are not equal; there is an advantage to the Prefurbia neighborhood that cannot be placed in terms of numbers. These are intangible advantages in living qualities and character of the units. The task of the surveyor when a developer hires them to design a development is to create the foundation so it matches the value of the homes to be placed on the site. Part of this value stems from how fast the homes sell, reducing the exposure in the market and reducing interest costs to carry the development. Looking at the layout (Figure 1), do you think a tight grid of townhomes will drive stronger sales (desirability to live within the development) than the above open neighborhood? Prefurbia townhomes are void of monotony, provide much better views out the windows with more space, have parking adjacent to the units, hide the cars from passing traffic, and showcase home fronts with porches. The Prefurbia construction cost is less, translating to more money that can be spent in architectural and character building elements. Now look at the plan at right in terms of projecting the future: 20, 30, or 60 years out. Will the design foster a sense of pride and accomplishment for the lower- to medium-income residents? None of the above has a “number” you can assign to it—these are intangible values. In the development of land, these intangibles add up to an advantage over standard subdivision platting. Prefurbia is similar to smart growth in that it delivers added value that cannot be tied to a geometric dimension or units per acre. The next comparison shows the single-family area (Figure 2). The original plan had 52 single-family homes. The total area of home pads was 93,207 sq.ft., or 1,726 sq.ft. per house including the garage. The 64 single-family homes in the Prefurbia neighborhood cover 114,526 sq.ft., equating to 1,789 sq.ft. average per unit, a gain of 63 sq.ft. on the main floor. If the single-family homes sell at $150 per square foot, then the value in the Prefurbia plan would be $9,450 greater per unit. On the conventional plan, upon entering the development, you immediately look directly into the rear of homes, which is typical of suburban designs. In this neighborhood, the rears of the homes will not have any architectural elements to foster a sense of value, nor will the exposed rear yards that will likely become cluttered over time. In the original plan, there are two forms of single family, one with shared driveways that service side-entry garages. The Prefurbia neighborhood uses coving, which eliminates monotony, provides a much greater sense of space, affords a larger average lot size, exceeds ordinance minimums, and hides the rear yards. There are additional intangible differences. The Prefurbia neighborhood uses architectural space as a component of the neighborhood functionality. In the original plan, there are a variety of lot shapes, but the home is a standard configuration. Prefurbia encourages (but does not demand) the home to fit the shape of the lot, increasing curb appeal and connection to surrounding open spaces. The Prefurbia single-family homes all have front porches. Do people actually sit on their front porch? Not always, but adding a front porch creates hominess for the neighborhood. It forms a connection from exterior to interior living spaces. Again, this is an intangible value but an important one to leverage sales and create lasting value. The Prefurbia neighborhood provides 3.35 acres in common open space (park area), which compares favorably to the conventional before-plan that provides 0.00 acres of park. Regarding driveway coverage, the original plan consumed 49,311 sq.ft. of surface area or 950 sq.ft. per home compared to the Prefurbia neighborhood at 49,984 sq.ft. total averaging 781 sq.ft. per home! Each driveway is tapered to the street, reducing paving, and each has individual geometry to reduce monotony. The 170 sq.ft. average reduction decreases construction costs by approximately $1,200 per home at $7 a square foot for installed driveway with a base. And that is without using the art of sculpting the single-family driveways with landscaped areas (see part three)—which would have reduced the driveway volume another 25%! Note that the townhome driveways used this low-impact design method. To compare the non-residential areas, we combine the area of the apartment (or condominium) buildings and the commercial areas of the original plan and see it provides 165,269 sq.ft. of ground-level leasable area. The Prefurbia neighborhood provides 153,975 sq.ft. of leasable area. Because we are converting apartment parking to commercial uses, we increased the ratio of parking, explaining why we gained 60 parking spaces. But again, the intangibles come into play. Retail space buried internal to a small land development might be socially responsible (residents have their coffee shop they can walk to), but it may not be practical. Since this is a small-scale development, the entire site is well within walking convenience. Creating commercial uses that become part of the neighborhood, but are visible to the rest of the consumers within town, increases the value to both commercial and residential uses. As a side note, all of the above methods and how to compile information is taught in Performance Planning System (PPS), which provides survey-accurate spatial information based on the physical coordinate geometry created during the design phases. There is no such thing as a perfect plan. Every design is a compromise. Creating a subdivision plat where the main thought is how to squeeze every possible lot onto a developer’s tract is so out of balance it’s off the charts. Prefurbia is all about balance, providing the elements that make a development a neighborhood, not some numeric exercise automated by a few mouse-button presses in a CAD system to knock a plan out the door as fast as possible. Prefurbia balances the economic and environmental impacts of development while creating a neighborhood that is a wonderful place to live, work, and shop. The neighborhood in passing the test of time could be called sustainable. Rick Harrison, author of Prefurbia and creator of Coving, is president of Rick Harrison Site Design Studio, which offers cutting-edge design solutions that enhance quality of life with the beauty of the natural environment. His technology, Performance Planning System, is marketed through Neighborhood Innovations, LLC.